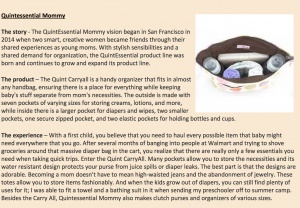 Congratulations to our ClientÂ QuintEssential Mommy for their feature onÂ KidsOutAndAbout.com! The Quint Carryall is a handy organizer that fits in almost any handbag, ensuring there is a place for everything while keeping baby’s stuff separate from mom’s necessities. The outside is made with seven pockets of varying sizes for storing creams, lotions, and more, while inside there is a larger pocket for diapers and wipes, two smaller pockets, one secure zipped pocket, and two elastic pockets for holding bottles and cups. Preparing for a day out is as simple as zipping up the carryall, dropping it in a purse, and walking out the door! Check them out atÂ quintessentialmommy.com.